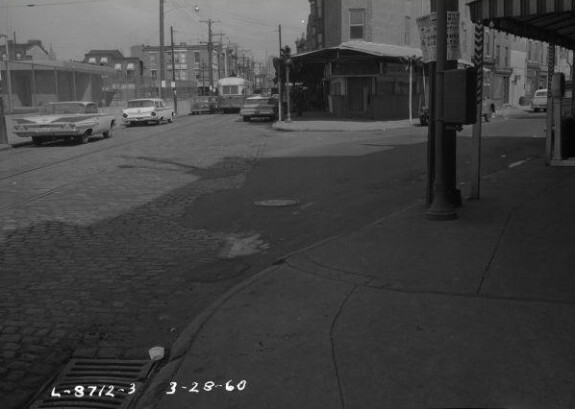 Shown here in 1960, the intersection of Ninth, Wharton, and Passyunk had not yet become the magnet for cheesesteaks later sought out by tourists and locals. Geno's did not open here across the street from Pat's until 1966. A cheesesteak is a sandwich unlike any John Montagu, the fourth Earl of Sandwich (1718-1792), might have encountered. Thin bits of frizzled beef served on a locally-made Italian roll, usually topped with fried onions and Cheez Whiz drawn from the can with a paint stirrer, the Philly cheesesteak also is distinguished, in part, by its place in presidential politics. Cheesesteaks originated in 1930 as simply steak sandwiches, the cheese part coming later. The undisputed creators, Harry Olivieri and his brother Pat, ran a hot dog stand in South Philadelphia. One day, weary of eating their own dogs for lunch, they grilled some sliced beef with onions instead. Before either could take a bite, a passing cab driver offered five cents for the sandwich and declared it better than their hot dogs. The brothers Olivieri did not make the steak sandwich their main attraction until 1940 when they opened Pat’s King of Steaks on Passyunk Avenue, where it intersects with Ninth and Wharton Streets. They did not initially add cheese because many of their customers in the neighborhood were Jewish and dietary laws barred them from eating meat and cheese together. But after Kraft introduced Cheez Wiz in 1952, Pat Olivieri realized he could simply take the lid off the industrial-size can, put the whole can on the grill to cook, and add cheese to some steaks without tainting the grill for his kosher customers. When Joey Vento opened Geno’s across the street from Pat’s in 1966, he acknowledged the Olivieris invented the cheesesteak, but insisted he made it better. To be sure, cheesesteak lovers can get their fix in almost any neighborhood in Philadelphia and its suburbs. But the intersection of Ninth, Wharton, and Passyunk remains the center of the cheesesteak universe. Both Pat’s and Geno’s are open twenty-four hours a day, and customers thrive on debating which shop makes the better cheesesteak. Whatever the arguments for either side, tourists, visitors, and even locals have made sampling cheesesteaks almost a rite of passage to knowing Philadelphia. In the rest of the nation, candidates in search of voters with whom to chew the fat routinely descend on classic diners and coffee shops. In Philadelphia, they go to the intersection of Ninth, Wharton, and Passyunk Avenue to prove their mettle by ordering a cheesesteak properly. Candidates need not consume all 1,200 calories, but they must know the lingo. 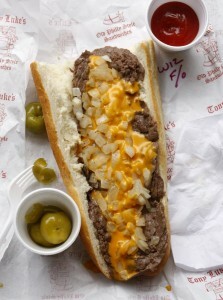 A cheesesteak “wit” has onions, while one with no onions is ordered “widout.” If no cheese is desired, the order is “plain.” The only acceptable cheeses are American, provolone, and the Kraft sauce known as Whiz. Both Pat’s and Geno’s have instructions posted. Still, in 2004 the Democratic presidential nominee, John Kerry, asked for Swiss and was ridiculed on the evening news. In 2005, when the Philadelphia Eagles faced the New England Patriots in the Super Bowl, then-Pennsylvania Governor Ed Rendell wagered a cheesesteak against then-Massachusetts Governor Mitt Romney’s clam chowder. The Patriots won (24-21), but Romney refused to eat the Philly cheesesteak, saying his cholesterol count couldn’t handle all that cheese and fat. The Philly cheesesteak made national news later in 2005 when Geno’s owner Joey Vento fed the national debate on immigration by posting a sign telling customers, “This is America – When Ordering Speak English.” The open-air food market surrounding Vento’s store, known for decades as the Italian Market, had by then attracted newer immigrants from Southeast Asia and Latin America. While Vento appeared on national television programs hosted by conservatives Glenn Beck and Lou Dobbs, the Philadelphia Commission on Human Relations charged him with discrimination. Vento ultimately was exonerated of the anti-discrimination charge and said at the time that if his family took the trouble to learn English, recent arrivals should as well. He died in 2011. The city’s claim to cheesesteak fame is recognized nationwide. Wherever cheesesteaks are sold, they appear on the menu as Philly cheesesteaks. Some high-end steakhouses, the kind that serve Porterhouse and T-bones, developed gourmet versions of the lowly cheesesteak. In 2004, restaurateur Stephen Starr introduced a Kobe beef version at his Barclay Prime restaurant. Made with Taleggio cheese, caramelized onions, and truffles on a brioche roll, and served with a split of champagne, it was priced at an even $100. Ever up-to-date, Starr later replaced that version with a wagu ribeye beef cheesesteak topped with foie grass, truffles, and fontina on a ciabatta roll—again with the half bottle of Perrier-Jouet Grand Brut and the $100 price tag. Even if those stylized versions are tasty, they miss the crucial point politicians reach for when they order a Philly cheesesteak. It’s about connecting with everyday people. Dianna Marder is a journalist who retired in 2012 after 27 years as a staff writer at the Philadelphia Inquirer, where she wrote about the courts, crime, and the cultural impact of food. Ferguson, Scott. “Philly’s Flavorsome Fight.” The Pennsylvania Center for the Book, (Summer 2008). Hines, Mary Ann, Gordon Marshall and William Woys Weaver. The Larder Invaded: Reflections on Three Centuries of Philadelphia Food and Drink. Philadelphia: The Library Company of Philadelphia and the Historical Society of Pennsylvania, 1987. Hyman, Carolyn. The Great Philly Cheesesteak Book. Philadelphia: Running Press, 2009. Katz, Solomon H. and William Woys Weaver. Encyclopedia of Food and Culture. New York: Charles Scribner’s Sons, 2002. Mariani, John F. Encyclopedia of American Food and Drink. New York: Lebhar-Friedman:New York, 1999. McCauley, Mary Beth. “Backstory: Philly’s Cheesesteak Wars.” The Christian Science Monitor, June 5, 2006. National Public Radio. “The Story Behind the Philadelphia Cheese Steak” (2000). 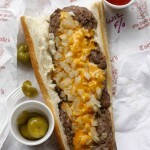 Top Ten Spots for Authentic Philly Cheesesteaks (Visit Philadelphia). 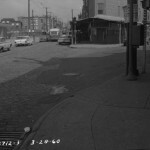 Pat’s and Geno’s, intersection of Wharton Street, Ninth Street, and Passyunk Avenue, Philadelphia. Donkey’s Place, 1223 Haddon Avenue, Camden, N.J., and Donkey’s Too, 11 Tomlinson Mill Road, Medford, N.J. I loved this essay. I grew up in Philadelphia in the 50’s and 60’s and always loved cheesesteaks with cheesewiz – but I never knew the origins of cheesewiz and why it was used on these sandwiches. I was particularly fascinated with that part of the story. I agree with Dianna that the expensive gourmet cheesesteaks totally miss the point. Future politicians should refer to this essay to understand how to relate to people throughd the lowly cheesesteak. Thank you, Ms. Marder, for your well written essay. That’s a particularly interesting story about the kosher reasons for the use of Cheez Whiz. I’ve always read that Joey Vento claimed to have added the cheese to cheesesteaks when he opened Geno’s in the 1960’s. The truth may be lost in the mists of South Philly legend. In any case, according to a notice in the Inquirer, Pat’s was already operating as a primarily steak sandwich restaurant under the name “Pat’s King of Steaks” at the 9th and Passyunk location by the middle of April, 1939. One of Philly’s greatest food rivalry is between two South Philly cheese-steak joints that may rival the The Liberty Bell for iconic status: Pat’s or Geno’s? Who makes the best cheesesteaks.